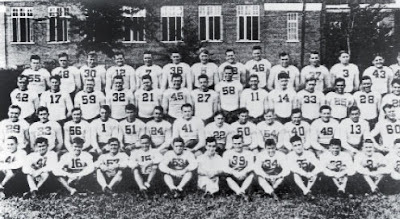 The 1934 Alabama line in a publicity shot prior to the 1934 Rose Bowl. 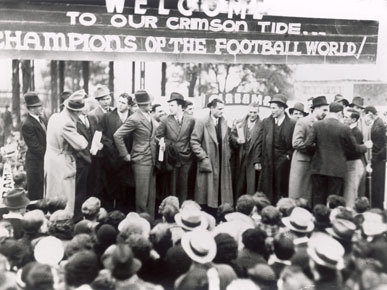 The 1935 Rose Bowl marked the start of a new chapter in the history of Alabama football. 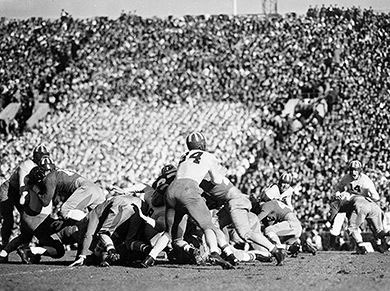 Under head coach Wallace Wade, New Year’s Day games in Pasadena and subsequent National Championships had become the norm. His departure to Duke University in 1931 left his hand-picked successor, Frank Thomas, loaded with high expectations. Thomas had been a player at Notre Dame under Knute Rockne and had entered the coaching ranks as an assistant at the University of Georgia. While well recognized for his understanding of the game, Thomas’ only head coaching experience before taking the Alabama job was a five-year stint at the University of Chattanooga. Yet, University of Alabama president George Hutchenson Denny made his choice and Thomas proved to be the man for the task. In his first three seasons at the Capstone, Thomas amassed a respectable 24-4-1 record. 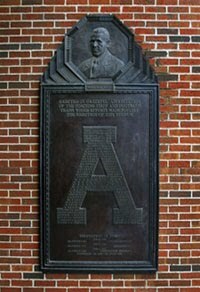 In 1933 his team was able to capture the Southeastern Conference Championship but a 2-0 loss to Fordham dropped their overall record to 7-1-1 and kept them out of the National Championship picture. Thomas was chomping at the bit all off-season knowing his squad was only going to be stronger the next year. Part of his confidence stemmed from possessing one of the most talented passer-receiver combos the game had ever seen. Quarterback Millard "Dixie" Howell and end Don Hutson were selected as consensus All-Americans in 1934 for the aerial attack they developed under Thomas’ tutelage. It would become the precedent for the modern passing game. The other end on the squad was a lanky young man from rural Arkansas everyone knew by the nickname "Bear" – Paul W. Bryant. His faith in his coach was unwavering. "The thing about Coach Thomas, like every fine coach, was that he was sound," Bryant recalled years later. "He beat you with the things he did best. Occasionally he would have one little new play for the opponent, but basically he preached blocking and tackling and executing." It proved to be an unbeatable formula in 1934. Alabama rolled to an undefeated regular season that was highlighted by dramatic wins over Tennessee and Georgia Tech. A Southeastern Conference title followed and no less than four different polling systems chose the Crimson Tide as the national champions. Meanwhile, out on the West Coast, Stanford University was putting the finishing touches on head coach Claude Earl Thornhill’s second season. An assistant under Glenn "Pop" Warner during the legendary coach’s seven-year tenure in Palo Alto, Thornhill took over the head coach slot in 1933 after Warner left for Temple University. Although Stanford had adopted the Indian mascot in 1930, Thornhill's squad came to be known as the "Vow Boys" for making a pact to never lose to conference rival USC. They kept the promise in 1933 handing the Trojans their first defeat in 27 games, a 13-7 loss at home. The victory gave Stanford the Pacific Coast Conference championship and a matchup with Colombia University in the Rose Bowl. The Indians subsequently lost 7-0 to the Lions and Thornhill finished his inaugural season with an 8-2-1 record. 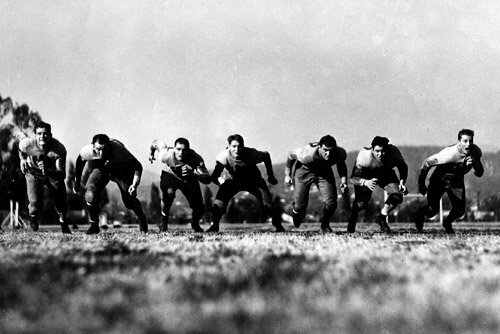 Stanford's 1934 team was even stronger than the previous year, boasting three consensus All-Americans; quarterback Bobby Grayson, end Jim "Monk" Moscript and tackle Bob Reynolds. The Vow Boys kept were good to their word the second year running, besting USC in Los Angeles on Nov. 3 that year. The Indians rolled up a 7-0-1 record and coasted to another Pacific Coast Conference title. As the regular season wrapped up, Stanford was ranked the No. 2 team in the nation and earned the inevitable Rose Bowl invitation. When Alabama was chosen as their opponent there was a feeling that the Tournament of Roses had made a grave error by selecting the Crimson Tide over undefeated Minnesota. The Golden Gophers were widely viewed as the best team in the country after racking up an 8-0 record and outscoring opponents 270-38 in the process. Even though numerous polling services tapped Minnesota as the national champion following the close of the college football regular season, the Big Ten Conference prohibited its teams from participating in bowl games. Thus, Alabama got the nod from the Tournament of Roses Committee. Many Stanford supporters felt the Gophers were a more deserving opponent and used the issue to taunt the Crimson Tide players when they arrived in Los Angeles. Hundreds of Indians fans flocked to the Alabama practices to loudly insist their team was going to whip the squad from the south decisively. Stanford’s coach was having none of it. "The boys know they've got a fight on their hands," Thornhill said of his players the day before the game. 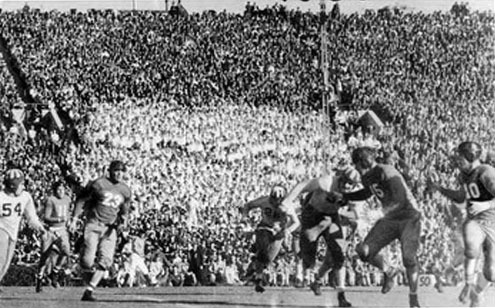 A record total of 84,474 spectators were on hand in Rose Bowl stadium on New Year's Day 1935 to see the two lauded teams face off at last. The Crimson Tide's luck started early with tackle Bill Lee calling the coin toss. Alabama chose to kick off and Stanford chose to defend the south goal, favored by the light breeze. Alabama was slow to get started in the game, amassing just four yards in four plays during the first period. Stanford got a break when Alabama’s Joe Demyanovich fumbled the ball on the 29-yard-line and the Indian’s Keith Topping recovered. A few plays later Stanford’s Bobby Grayson plowed in for the score and Stanford had the lead 7-0. That situation held until the second quarter when Thomas unleashed the Crimson Tide’s passing attack and Alabama’s offensive exploded for a flurry of scores that Stanford was all but helpless to stop. Alabama’s second possession in the second quarter began with a bang as Howell returned the kick 25-yards to the Indian’s 45-yard line. Howell then completed passes to Hutson, James Angelich and then Bryant to reach the 5-yard line. On the next play Howell kept the ball and blasted through the line where he was hit and did a complete somersault in the air. Amazingly, he landed on his feet at the two-yard-line and bounced into the end zone for the score. Riley Smith missed the point after and Alabama cut Stanford’s lead to 7-6. Stanford then chose to kick the ball. Alabama drove back down the field on their next possession but the Indian’s defense held this time. Thomas called a timeout before Smith was set to attempt the 27-yard field goal. During the wait the kicker overhead Bryant and another player arguing if he could make it after the missed point after a few minutes prior. "You sonsabitches should have better confidence in me than that," Smith told them then went out and booted it through the uprights. Alabama took the lead, 9-7. Once again, Stanford chose to kick off to the Crimson Tide. Two plays later Howell made them pay for the decision, carrying the ball around the right side of the line and down the sideline for a 67-yard touchdown run to lengthen the Crimson Tide lead to 16-7. Any hopes Stanford had for recapturing the momentum before halftime was ended with an interception by Alabama’s Smith giving the Crimson Tide the ball on the Indian’s 46 yard line. With just eight second left in the half Alabama’s Joe Riley completed a 24-yard pass to Hutson who galloped the rest of the way into the end zone. Another missed extra point and the score 22-7 in favor of Alabama. After halftime Stanford tried to regain the momentum and launched a frantic drive to catch up. A 74-yard Indian drive was topped with a 12-yard touchdown run by halfback Elzo L. Van Dellen Jr. The Alabama lead narrowed to 22-13. In the fourth quarter, Stanford fans, upset at the beatdown their team was receiving, began throwing money onto the field during a timeout in hopes of distracting the Alabama players. Bryant recalled scooping up some of the change in his hands but then having to drop it when he had to tackle a Stanford runner heading downfield on a sweep. "It was the only decent tackle I made all day," he later said. The gambit didn't stop the dynamic combo of Howell and Hutson from striking one more time. On third and 23 from the Alabama 41-yard-line, Howell completed a 59-yard touchdown pass to Hutson to seal the game. The kick by Smith was the final point of the game, 29-13. Howell finished the game with 111 yards rushing, 164 yards passing and punted six times for an average of almost 44 yards. 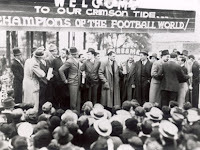 No less than legendary sportswriter Grantland Rice described his performance as "the greatest all-around exhibitions that football has ever known"
Once again, Alabama’s victory in Pasadena had brought a fourth national championship to Tuscaloosa and the fans in Alabama showed up to show their appreciation. On Jan. 5, thousands of fans mobbed the Tuscaloosa train station to welcome the team back home. Hutson went on to play for the Green Bay Packers, eventually being enshrined in the NFL Hall of Fame. Howell played for the Washington Redskins for several years and was a head coach at Arizona State University as well as Idaho. Both are now in the College Football Hall of Fame. The next year, Riley Smith became the first Alabama player selected in the inaugural NFL draft when he was chosen second overall by the Boston Redskins. Bryant, of course, went onto one of the most celebrated coaching careers in college football history.